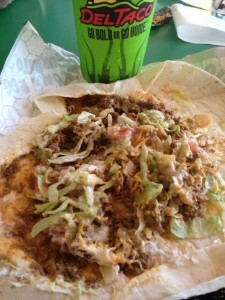 There is ALMOST ALWAYS SOMETHING YOU CAN EAT in every fast food place or restaurant. I know I usually end up sitting outside the restaurant, using my phone searching for the menu to see if there are safe options BEFORE I go in. That way, I’ll have a plan in mind already when I start looking through tempting menu items that I shouldn’t have. In order to make it easier for myself and anyone else who needs a quick keto friendly option, I’ve compiled a list of several restaurants and fast food joints with what I’ve found to be the lowest carb (and most emotionally satisfying) choices. These are not all perfect options, but when you’re stuck with no other choices due to time or location constraints, they’ll do in a pinch. A lot of this info is culled from lowcarbdiets.about.com. I have to say, it’s a huge help that these fast-food places are required to post nutritional content. It gets easier to follow the keto plan every day. The carb counts I’m listing are approximate and is NET grams. Salads – no croutons. Stick with low sugar dressing options – Caesar, Blue Cheese, Ranch, Chipotle. Look at the name which may give you a clue “honey” dijon is 9g. Check the ingredient for items that are higher in carb content. 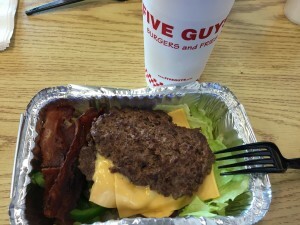 Five Guys – my favorite starts off the list. Order the bacon cheeseburger in a bowl, add lettuce, grilled onions, grilled mushrooms, jalapenos, then ask for extra cheese and bacon (no charge!). Carb count will vary depending on what you top yours with (onions can be carby), but all-in-all it’s a very satisfying meal for few carbs. McDonald’s – burger(zero g) or grilled chicken (2 g) without the bun and topped with cheese, mayo, mustard, onions, etc. No ketchup. Add a side salad (3g). Caesar salad with grilled chicken or bacon ranch salad with grilled chicken (9g). Burger King – same burger info as McDonald’s: burger(zero g)without the bun and topped with cheese, mayo, mustard, onions, etc. No ketchup. The tendergrill chicken sandwich without the bun is 3g. BEWARE – you might think the veggie burger is low, but it is 19g of carbs, so that’s about a full day of carbs on keto. Add a side salad (3g). The tendergrill chicken garden salad is 8g without dressing or croutons. The tendercrisp chicken salad is not an option. Do not attempt. BONUS – dessert?! – the fresh apple fries are not fried and are 5g net carbs WITHOUT caramel sauce. Subway – Probably should skip Subway if you can. The buns and wraps are all high in carbs. I guess you could just have them throw the ingredients in a wrapper sans bun, but that doesn’t sound appealing. I have no info on what the carb count would be for each bunless sub, but you can probably figure it out – chicken or pepperoni is fine, but is “sweet onion” chicken okay? No idea. Stick to the salads, but realize you’ll only get iceberg lettuce (4g). Carl’s Junior and Hardees – This chain offers “lettuce wraps” – your burger wrapped in a large piece of lettuce for easy low carb eating. I’ve tried it and don’t love it. I like to carry my own fork instead. Bunless options – Six dollar burger (7g), 1/2 thick-burger (5g), charbroiled chicken club sandwich (7g/10g at Hardees). Grilled chicken salad without croutons is 10g. Side salad is 3g. Jimmy John’s – The unwich – a sandwich wrapped in lettuce – fits the bill here. Meats are fine, just make sure the ingredients are not carb-rich. Wendy’s – Again, you can get your burger in a lettuce wrap or a box. Any burger with toppings. Mayo has corn syrup, so is 1g. The chicken grill fillet is 1 g. It can be ordered in the chicken club sandwich or the ultimate chicken grill sandwich. 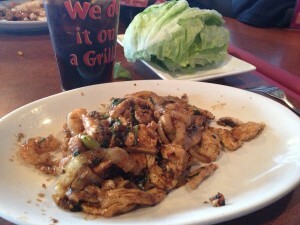 Best salads: chicken caesar (7g), blt chicken salad with grilled chicken. Side salads aer 6g or 2g for Caesar. Pizza Hut and others – I actually got used to eating pizza with no crust. You need to eat twice as much, but if there’s a party or dinner out that you can’t avoid at a pizza place, just slide the cheesy toppings off and eat the big messy pile of cheese and toppings. A side salad is a nice addition. Otherwise, I’d just opt for making my pizza at home with a low-carb crust. Mongolian Barbecue – YES! Load up your bowl with chicken, shrimp, onion slices, and mushrooms, then top with the Asian black bean sauce. I know beans have carbs, but the label says 1 gram of carbs per ounce. Add a bit of garlic and wait for the griller to do his work. It goes without saying that you skip the appetizers, tortillas, and rice. Ask the wait staff not to bring them to the table. Italian Restaurants – For example, what about chicken marsala in an Italian place? Make sure it doesn’t come with pasta. Substitute broccoli or some other keto-friendly side dish – or a big salad. Mexican and Chinese Restaurants give me the most difficulty, because any low carb option is not the reason I would go to the restaurant in the first place. At a Mexican restaurant, I tend to get a large burrito (see the Del Taco picture) with no beans and spread the soft tortilla out like a plate. Eat the inner ingredients and toss the tortilla. Convenience stores can be a good option too! 7-11 has packs of hard boiled eggs, cheese slabs, slim jims, almonds, and pork rinds. Whatever you choose, hold the bread, potatoes, rice, noodles, fries, and tortillas. And watch out for the possibility of corn starch, bread crumbs, and other fillers.